The best Hitchcock film Hitchcock never made. That's how certain enthusiasts of American film think of Charade, Stanley Donen's 1963 lightly comedic mystery thriller filled with international intrigue. Its cast list draws deeply from the era's formidable well of cinematic icons: Cary Grant, Audrey Hepburn, Walter Matthau, James Coburn, and George Kennedy. Its action takes place in no less a screen-illuminating world city than Paris. The Criterion Collection has seen fit to give it a scholarly, respectable DVD and Blu-Ray release. It comes scored by Henry Mancini. It has inspired four remakes, including one in Bengali and one in Hindi. It director also made On the Town, Singin' in the Rain, Funny Face, and Bedazzled. "A terrifically entertaining comedy-thriller," critic Dave Kehr calls it, "perfectly crafted" and "a marvelous use of Paris." All these qualities and more strongly recommend the picture, at least to my mind, and if you'd like to see it for yourself, you have only to pull it up on Archive.org. Wait — really? A film of such seemingly high profile, made only 49 years ago? You don't exactly come across the likes of Charade in the public domain every day. But I have an explanation, and it will surely delight those film fans who make sport of pointing out the incompetence of major studios. 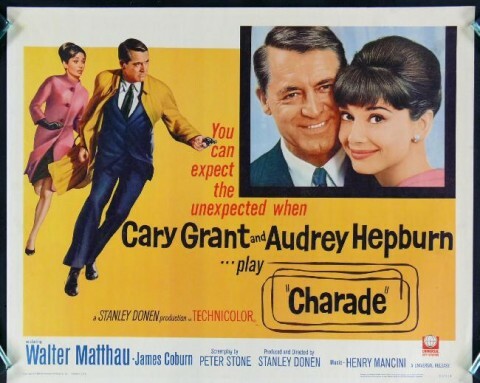 It seems that pre-1978 United States copyright law absolutely required you to include some sort of mark on your work indicating your intent to claim copyright at all — ©, for instance — and in Charade's case, Universal Pictures seemed to have just sort of forgotten about it. The film thus went public domain as soon as it came out. Criterion's provides a superior transfer and a wealth of cinephilic accoutrements besides, but if you want to dip into the picture right now, simply click play. An unknowable but capable Cary Grant and a Givenchy-clad Audrey Hepburn pursued through the early sixties' City of Light for gold stolen in wartime — who, especially those on an office lunch break, could resist? You can, of course, find Charade listed in our collection, 1,150 Free Movies Online: Great Classics, Indies, Noir, Westerns, etc..
A witty,sophisticated, fast paced, entertaining, and delightful film. I’m confused, so because of the genre ‘film enthusiast’ think Hitchcock would of directed it better and it would have been his best work? I first saw this at the cinema as a child- I didn’t understand at the time, the significance of a corpse being stuck with a pin? The semblance of an Alfred Hitchcock film is uncanny-malthough it is missing his distinctive trademark. with a cast like that and the production/direction spot on I would surprised that anyone could find a bad word to say about it. I would add that I thank you for putting this online because I missed it first time round at my country cinema because I was unwell at the time and once it was shown that was it in this days. No second chances then. I’ve tried to watch a few films like this one. All of them restricted to my region. So how is it an open culture? It is NOT a Hitchcock film. It was produced and directed in the Hitchcock STYLE…but by Stanley Donen, not Hitchcock. I must be groggy, dyslexic, a careless reader…or all three. Sorry for stating the obvious in my previous comment. Unfortunately the embedded video to which you link has been taken down. Is there anyone fighting for the Public Domain the way that FSF fights for free software? This film is not free, my friends. It is outrageously filled with long, loud, greedy commercials. Colin never said this was a Hitchcock film. He says right in his post this is “the Best Hitchcock Film Hitchcock NEVER Made”. So……what’s the big deal?